Back in March, I was fortunate enough to have the opportunity to spend 4 days in the same room as Clare Frank PT, DPT and Magdalena Lepsikova MS, PT. One year ago I took the DNS A course from the pair and had my mind blown by the information presented to me. After one year, and many clinic hours of practice with the information learned at DNS A, I was left wanting more. For those of you who don’t know what DNS is, I will give you the DNS for dummies review. DNS is basically a method or tool of rehabilitation that works with the interplay between the locomotive/movement systems of the human body and the environment it interacts with, while utilizing developmental positioning and movements to promote a return to more natural movement patterns. Essentially, using positions and movements that babies use to return normalized function to the human body. A big aspect of DSN A that many people had not heard of prior to the course was joint centration. And it did not go away with the B course. Joint centration, is basically making sure that a joint is in a position during a movement that allows for proper length-tension relationships of all muscles, which promotes proper mobility and stability patterns within the joint. Over the four days, this concept was ingrained in the 17 of us at the course. One thing that struck me when watching Clare, or Magdalene work was that they would often hold their “patient’s” body in a position, or provide the stability of a joint for them, so the peripheral muscles could function properly, instead of being over-stressed by trying to create movement AND stability. B course differed from A in that the developmental progressions were more advanced, going from supine/ and prone all the way to standing, where as A course left us still on the ground. I have found that the progressions from supine and prone to standing have been more applicable to my practice in the two months since taking this course. Another great part of DNS is the emphasis on breathing and recognizing faulty patterns in relation to trunk stabilization, and ultimately peripheral movements. One fact that needs to be relayed to the reads of this is that we take an average of 16 breaths per minutes every day. This results in over 20,000 breaths per day. If you have tension in your neck, you may want to have your breathing pattern at rest looked at. Because no matter how much stretching you do, if you are using accessory muscles to help you breathe 20,000 a day, that tension is not going to go away. I feel that after taking the DNS B course, my grasp of their concepts and methodology has grown significantly. I am already looking forward to take DNS C course next March in Los Angeles. 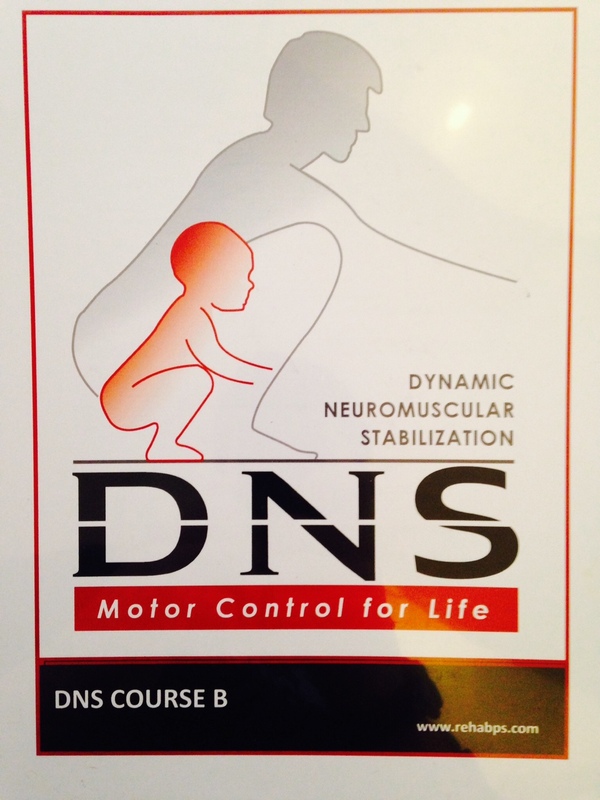 If you would like to discuss any aspects of DNS please don’t hesitate to e-mail me at kineticpotentialpt@gmail.com!